If you are interested in taking a professional development program, how do you hear about it? How did that program get its information out to you, the student? This week, Fiona’s away. Instead, PDCE Marketing Manager Heather McGregor joins Dave as they talk about the challenges of marketing educational programs, getting the word out so that the maximum number of people are aware of them. They give some insights into how you can keep up to date with PDCE programs, as well as some ideas for those of you who may be creating and marketing your own programs. We’d love to hear from you about your thoughts on our discussions or interviews and we’re always open to hearing suggestions for the show. Email us at podcast.pdce@ubc.ca. Or find us on Libsyn too, of course. And we are also on Stitcher and Blackberry Podcasts too! So you can take us with you no matter what mobile device you have. Just search for PDCE or Down the Hall on your Stitcher or Blackberry Podcast app if you don’t currently have access to the web. Just a note that the views expressed in the podcast are those of the hosts and guests, and not necessarily the views of either PDCE or the Faculty of Education at UBC. More details, including the link to the episode itself and the time stamps, after the jump. This week, Down the Hall is visited by royalty. Ok, not actual royals, but your hosts do talk about the new addition to the British royal family, Prince George of Cambridge (the name was not known at the time of recording). As well, there are the plans for Leicester Cathedral to be the new resting place for the remains of Richard III. This week on Down the Hall, Dave goes on vacation, and Fiona and Alpha kick off the episode with with a lively discussion about a study featured in the Globe and Mail about how random acts of kindness have affected a group of Canadian children. Dave “returns” in an interview with Dr. Elizabeth Jordan to discuss the spectrum of special education, how it has changed over the last decade, and how the UBC Diploma in Special Education can support a teacher in this field. Just a reminder to our regular listeners that we are taking a summer break and will not be posting a show on July 12th, but we’ll be back on July 26th, ready for more Down the Hall! This week, we have a two-pronged episode for you, something for everyone. Dave interviews Dr. Harry Hubball about the SOTL (Scholarship of Teaching and Learning) certificate program here at UBC. Faculty members and educational leaders from around the world take this program to improve their pedagogy and leadership abilities, bringing this expertise back to their universities. They talk about the history of the program, its great successes, and what students in the program get out of it. Your hosts also take on the subject of heart and mind education, as Fiona talks about a truly enriching opportunity she took part in and Dave gets philosophical. It has long been known that educating the heart is as important as educating the mind, and programs are starting to take this into account. Finally, they talk about sharing photographs on the internet. Do you do that? If so, what are your thoughts on how you do it? How careful are you? We want to know, and your hosts tell you their thoughts as well. In some areas of Africa, there is a shortage of teachers and good quality education. Thankfully, there are many initiatives to help address this shortfall. On this week’s episode, Fiona talks to Dr. Samson Nashon about the Faculty of Education’s work in a joint educational program at Dadaab. They highlight the diploma in Teacher Education that is being offered as part of a collaborative education program with various other institutions and with help from CIDA funding. Samson talks about his work in the project and discusses issues of culture, international development and awareness, and a lot more as well. It’s a fascinating interview. Before that, your hosts talk about mobile devices in the classroom. Are they a force for good or evil? Or both? Many of us live in a visually-driven world. We gain so much information through sight that we take it for granted. We see a document, a television program, a work of art, the sun casting a shadow on the pavement. Have you ever stopped to think what it might be like if you could not see? How would you do everything you do now without sight? This week we catch up with Dr. Kim Zebehazy, orientation and mobility specialist here at UBC. Kim talks about considerations for visually impaired people both in a classroom and out in the world and how they are able to participate in some of the things we take for granted. She even talks about how visually impaired people enjoy art, proving that there is more to art appreciation than meets the eye! To experience orientation and mobility issues first hand, your hosts don a blindfold and use a long cane to navigate their way around the Scarfe Building under Kim’s supervision. We have photographic evidence that there were no calamities or broken anything along the way. Not even a bruise! (Thanks to Kim!) We talk about this in the show and reflect on what we learned from the experience. With the end of the term and many people finishing up all of their courses, MOOCs, or other educational opportunities, we thought we’d give you a light-hearted episode this time around. Dave spoke to Marie-France Hetu, a Master of Educational Technology student who is graduating from the program in three weeks. They spoke about her experiences in the program and what drove her to take the program, but they also spend a lot of time talking about her experiences at the India-Canada Conference at SNDT Women’s University in Mumbai, India. What was it like, both the travel and the conference itself? We also introduce a new segment to the show, The Exit Question. We want your opinions on a hot topic of the day. Send us an email and let us know what you think! Or leave a comment on the post itself. And we are now on Stitcher and Blackberry Podcasts too! So you can take us with you no matter what mobile device you have. Just search for PDCE or Down the Hall on your Stitcher or Blackberry Podcast app if you don’t currently have access to the web. First, Fiona talks to Dr. Candace Galla about language revitalization, the different means of storytelling, her recent research grant, and her preparation for the Aboriginal Language & Literacy summer institute. At the time of their conversation, Candace was getting ready for the Living Our Indigenous Languages Through Multimedia Technology event that took place on April 13. It’s a fascinating interview that we’re sure you’ll enjoy. After that, Fiona talks to Dr. Jessica Dunkley, a indigenous student who is graduating from UBC in May. They discuss Jessica’s experiences here at UBC as an indigenous student as well as the recently completed Walkabout (which you may have heard your hosts talk about once or twice recently). Walkabout was a virtual tour of over seventy indigenous communities, territories, and organizations in British Columbia. There’s lots of fun in this episode, so we hope you enjoy it. It’s Easter weekend, and we’re giving you an early Easter treat since we won’t be able to post next week. Do you have any Easter traditions? Your hosts share their traditions, past and present, as well as their chocolate addiction. Fiona talks about scary movies (alternative title to this episode: Ea Ooa, and you’ll have to listen to find out why) and animal baking with Bunny Buns. We’re also celebrating the coming of Spring! And finally seeing some sun. Also, congratulations to those of you who completed Walkabout 2013! 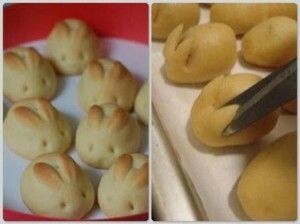 These delicious bunny buns can be found on the Holy Spoons web site. If you’re not hungry before listening to this episode, then you will be afterward! This week’s episode is devoted totally to food. Fiona interviews Barb Finley, the creator of Project CHEF (which stands for Cook Healthy Edible Food), which is a program designed to teach students in the K-7th grade range about healthy food: where it comes from, how to prepare it, and how to enjoy it. 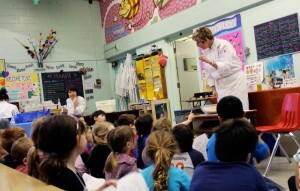 Fiona and Alpha (our producer) spent an afternoon at Bayview Elementary School where that week’s program was being held. They got to see it in action, talk to some of the kids, take some great pictures, and also get Barb to talk about the program and how valuable it is. It’s very successful, and judging by their experience, it’s a lot of fun, both for the kids as well as for the adults who are helping them. They even got pizza, made by the kids in the class! It’s a fun interview with some really great guest appearances as well. Back in the studio, your hosts discuss their cooking history (or lack thereof, in Dave’s case) and Fiona has a great cooking suggestion for our listeners as well.